SpaceX’s Crew Dragon Capsule will be responsible for safely transporting NASA astronauts to the International Space Station. 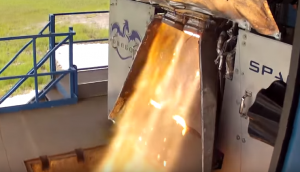 The capsule’s escape engines, the SuperDracos, were recently tested 27 times in McGregor, Texas, to ensure that they are ready to carry the spacecraft to safety in the event something goes awry during launch. The Crew Dragon can hold up to seven passengers and is specifically designed to travel to the ISS on top of a Falcon 9 rocket. Four pairs of the SuperDracos will be embedded inside of the walls of the capsule and will will fire up and rapidly propel the Crew Dragon away from the rocket if an explosion occurs. SuperDracos will power the Crew Dragon spacecraft’s revolutionary launch escape system, the first of its kind. Should an emergency occur during launch, eight SuperDraco engines built into Dragon’s side walls will produce up to 120,000 pounds of axial thrust to carry astronauts to safety.